Friday, July 20 | 5-6:30 p.m.
AJ Entertainment presents …The Bluesy Ratts! This exciting duo combines the showmanship of the Blues Brothers with the classy style of the Rat Pack. 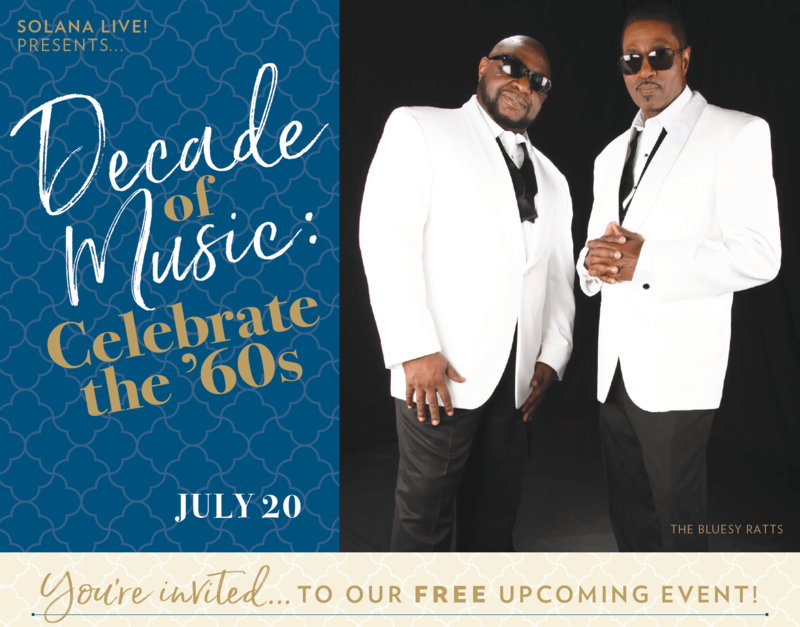 International performers Alfonzo Joyner and Curtis Cumbo bring their acclaimed vocals and spirited personalities to Red Sky for your enjoyment. Saturday, July 21 | 10-11 a.m.
Join us for a cup of coffee and a friendly chat about living options and more. Speak with downsizing resource experts from Lifetime Transitions, Craig and Anita Reisinger, and the Solana team. Monday, July 23 | 10 a.m.
Come breathe, stretch and relax in a feel-good class that focuses on stress relief and self-care. To learn more about these events or life at The Solana, call (770) 766-3913 today. We hope to see you there!